Another new release developed jointly between DJ and his son JD Short. A Silver Haze mother, Bay Area origin clone, pollenated by the famous 'stretch-indica' blueberry male to create the same cross as the Blue Dream. 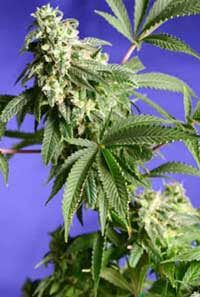 The Azure Haze, however, is one generation closer to the P1 landrace ancestry--the Blue Dream cross used an f5 Blueberry male, whereas the 'stretch-indica' Blueberry male used in the Azure Haze parentage is an f4. A vigorous hybrid, this cross is very easy to grow and quite forgiving, making it ideal for the novice or expert grower. Medium- tall height sporting elongated, spear-shaped flower structure of densely packed small-sized calyx yet hefty buds. Medium finish time of 9 to 10 weeks (60 to 70 days). An initially uplifting experience, the full effect slowly comes on to end with a dreamy finish Strong and long-lasting potency with minimal tolerance build-up. A fruity palette with mixes of melon, berry, citrus and evergreen high-notes. Enjoyable day or night. "Warning, sprouts and young seedlings may be sensitive to high nutrient concentrations. Avoid high nutrient concentrations initially and graduate slowly up to desired ppm." Developed from different new genetic lines, unique to Europe. Also Blue Velvet and Flo are developed from totally new genetics. These genetics are of high quality, and have not been grown in Europe before. Mostly indica dating back to the mid 1970's. Large producer under optimum conditions. A dense and stout plant with red, purple, and blue hues, usually cures to a lavender blue. Very fruity aroma, and taste of blueberry. Produces a notable and pleasantly euphoric high. Highest quality and is very long lasting. Medium to large calyxes. Blueberry Long shelf life, stores well of long periods. Flowering indoors 45 to 55 days. Cocoa Kush a structurally Kush hybrid of a cross between a female Blueberry Sativa (from the exact same seed stock that produced the mother of the Blue Satellite; the mother of the Cocoa Kush being large with some variegation and lavender/blue hues especially on the undersides of dark leaves on an asymmetric plant often with no discernable main stem and long side branches reminiscent of the original Chocolate Thai both structurally and experientially) crossed with the Original Blueberry male (a stretch-indica). This quasi hybrid grows medium-height Kush like plants with short nodes, large, dark green foliage, thick yet sturdy hollow stems and tight yet elongated buds of swollen calyx/bract flowers completely coated in large, clear trichomes of superior aromatics. Flower time is approximately. 55 to 60 days, with the more interesting oils developing in the very last week. Cocoa Kush possesses a complex yet subtle palate of a nutty/licorice/chocolate/tobacco blend with a creamy/floral/fruity background. The experience of the finished product is of top-shelf quality; smooth, yet with a bit more intense, take-your-breath-away (almost overpowering) initial experience that mellows finally to a sleepy/dreamy finish. Upon final testing, a few individual plants from the Cocoa Kush provided an experience and structural aesthetic very similar to the Blue Velvet; i.e. 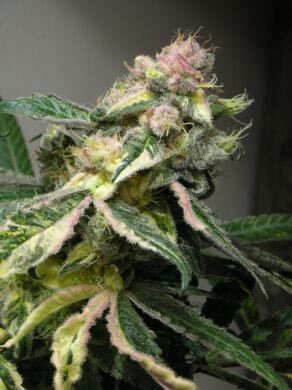 dense, large calyx, lavender foxtail buds that produce a very exciting yet sedate experience. Please note: approximately. 15% of the plants from this line will sport variegated growth patterns. The other 85% will grow uniform plants with slight variation in height. Extended vegetative time coupled with early topping is recommended to increase yield, or run un topped in a SOG type system. Indoor flowering 55 to 60 days. Developed by JD Short, the F13 Throwback is a revival of the original F13 strain. 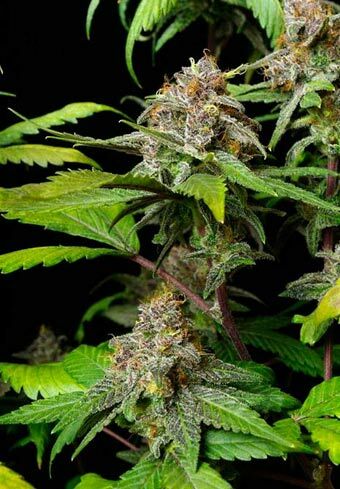 From a large selection pool of original stock, an exemplary specimen of F13 was selected and pollen from the F4 Blueberry stud was applied to her. The intent was to lock down the traits of the mother plant selected at a ratio 2 per 10 seeds. The project was a success and we now have a working replica and revival of the original F13. F13 Throwback is a sativa dominant strain in structural appearance and effect. It is a medium tall plant and does well when topped or in a srog grow. F13 Throwback produces spear shaped flowers and calyxes stacked one on top of the other and overlapping at the top of the cola. When conditions are right she finishes with some of the most beautifuly deep indigo blues and violets and is a copius producer of resin. The effect is stimulating and can be a little psychedelic. Good for dancing, working out and as an aphrodisiac as well as producing extreme munchies. "All seeds are sold for the purpose of end use onle. No authorization is given for commercial reproduction of the genetics contained within. Warning, Avoid excessive heat." Sativa indica cross. Very sativa phenotypic characteristics. Matures very early. Large, tight, spear shaped buds, made up of small, densely packed purple calyxes. Taller and likes to branch out. Indoors, the buds are fully mature by the end of their sixth week. Outdoors, super producer when multi-harvested over a period of time. First buds are ripe about the third week of September. 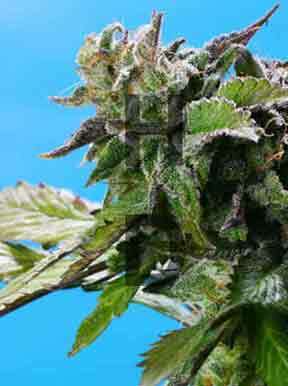 About every 10 days, new buds form - harvested through the end of November, conditions permitting. Ideal for greenhouse production. Motivational high - quite unique. Flavour is like Nepalese Temple Hash. Pleasant and enjoyable experience. Rated #1 strain at Cannabis Cup '96 by CC magazine. Indoor flowering 55- 60 days. A very productive hybrid of high quality. This plant exhibits partial to full leaf deformities of the crinkle type but with good structure and heavy bud production of large calyxes, a high yield plant. The buds express a strong sharp/fruity odour with a distinct sweet/grape flavour brought out in the cure. A strong, long-lasting head/body mix is evident in the finished product. An exciting, but not racy head, and a mild narcotic body, very euphoric and desirable effects that most seasoned heads prefer. Yields are above average. Vanilluna (aka Vanilla Moon) a structurally Kush hybrid of a cross between a female Blueberry Sativa (from the exact same seed stock that produced the mother of the Blue Satellite; the mother of the Vanilluna being large, green, symmetric with a distinct dominant main-stem and compact nodes, little variegation and long side-branches) crossed with the Original Blueberry male (a stretch indica). This quasi-hybrid grows medium-tall Kush-like plants with short nodes, large, dark green foliage, thick-yet-sturdy hollow stems and tight, spade shaped buds of dense-but-elongated and swollen calyx/bract flowers completely coated in large, clear trichomes of superior aromatics. Flower time is approximate. 55 to 60 days, with the more interesting oils developing in the very last week. Vanilluna possesses a complex-yet-subtle palate of a creamy, vanilla/honey blend with a hint of floral bouquet and sweet melon musk. The experience of the finished product is of top-shelf quality; smooth, comfortable, very long-lasting (hours) and dreamy. Upon final testing, a few individual plants from the Vanilluna provided an experience very similar to the Blue Heaven, i.e. calming, clear and relatively anti-anxiety. Please note: approximate. 15% of the plants from this line will sport variegated growth patterns. The other 85% will grow uniform plants with slight variation in height. Extended vegetative time coupled with early topping is recommended to increase yield, or run un-topped in a SOG-type system. Developed by DJ Short's son, 'JD', the Whitaker Blues is a true Oregon heritage cross. The mother of the Whitaker Blues is currently referred to as 'Quimby'; an old-school, West Coast staple cut reminiscent of a classic, early indica lineage--strong and sleepy in its effect. Quimby was crossed with DJ's personally selected Blueberry father, making the Whitaker Blues appear approximately 80% indica and 20% sativa in structure. It is a stout hybrid, short branching, sporting large, compact buds loaded with resin--very vigorous and productive, with hues of violet and blue at its 55-62 day finish. Finished buds have a pungent/sweet velvety grape and slightly vanilla flavor. Effect is strong with slight initial stimulation inspiring increased appetite (munchies) and a sedate after effect.